Hooray! The full version of Teen Top's "Going Crazy" finally came out! At first, I was confused how people got these gifs (example below) in tumblr, so I thought another teaser came out (I was wrong =_=). 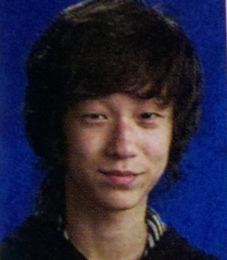 Not pretty sure if it's L.joe, but it looks like him. Okay, back to the full version talk. I thought to check in with Allkpop since they're always up-to-date with things and woop-dee-doo, the full version came out. It's about time! Okay~so that was totally different from the drama version. I totally thought this song was going to be slow and sad (and again, I was wrong =_=). The video was pretty cute though, even if I did not know what the story line was about or overall, what they were saying. But what caught my eye in the video was the almost end-ish part of the video, when they were wearing a white t-shirt and jogging pants *drools*. Simple things always grabs my attention. Wait is that you Bunni? p.s. I don't have a blog, website, or any link other than email, so I'm putting winglin.net ~if you don't mind~ MWUUUHHAHAHAA! You mean the highschool pic?